Urban school superintendents face unprecedented challenges. They must ensure that all students achieve a high level of performance despite a lack of resources, the intractable problems of race and poverty, a chaotic governance structure, and the often conflicting demands of teachers, parents, unions, and the community. 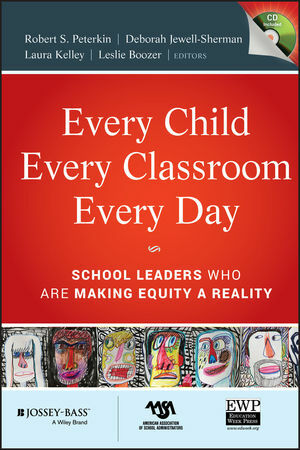 This important book, edited by the co-directors of the prestigious Harvard Urban Superintendents Program (USP), explores the ways in which superintendents can make a difference in the lives of each child, every day, by being knowledgeable about and driven by what happens in the classroom. The editors and distinguished contributors cover a wide range of vital topics that superintendents face from the day they are hired to the day they retire, such as how superintendents can most effectively communicate their vision, plan strategically, institute instructional reform, engage the community, and allocate resources. The book is filled with illustrative examples of well-known superintendents who are trailblazing new means to achieve educational fairness for all children and are changing the landscape of urban school systems today. In addition, Every Child, Every Classroom, Every Day highlights the Urban Superintendents Program's Leadership Framework, which is designed to aid administrators and educators in decision making and achieving equity. An ancillary CD containing teaching notes and exhibits is also included (in the print edition only) as an aid to teachers who wish to scaffold material discussed in the text. Co-published with Education Week and the American Association of School Administrators. Robert S. Peterkin, EdD, and Deborah Jewell-Sherman, EdD, are co-directors of the Harvard Urban Superintendents Program (USP). Laura Kelley and Leslie Boozer are both aspiring superintendents and doctoral candidates studying educational leadership in USP at the Harvard Graduate School of Education. Established in 1990, the Harvard USP is recognized as the nation's premier program for preparing individuals to lead urban school districts. About the AASA, Education Week, and Education Week Press. Preface: The Superintendent of Learning: A New Way of Leading School Systems (Paul D. Houston). ONE The Urban Superintendents Program Leadership Framework (Larry Leverett). TWO A Superintendent’s Entry (Leslie Boozer). Breathing Life into Your Vision (Holly Weeks). Meria Joel Carstarphen, St. Paul Public Schools: Where Imagination Meets Destination (Leslie Boozer and Laura Kelley). Communicating to Change the Culture (Brian G. Osborne). Planning to Succeed: Strategic Approaches for Every Superintendent (Janice Jackson). Maria Goodloe-Johnson, Seattle Public Schools: The Strategy Behind the Plan (Leslie Boozer and Laura Kelley). The Best Laid Plans . . . (Maree Sneed). Leading Learning in Urban Schools (Richard F. Elmore). Deborah Jewell-Sherman, Richmond Public Schools: Getting to the Heart of the Work (Kristy Cooper, Laura Kelley, Leslie Boozer, and Aaliyah El-Amin). Building New Structures and Options for Success (Rudy F. Crew). SIX School Boards and Unions. Moving Ahead with School Boards and Teachers Unions (Susan Moore Johnson). Andr´ es Alonso, Baltimore City Public Schools: The Superintendent and Board Partnership (Laura Kelley and Leslie Boozer). Pragmatic Radicalism: The Superintendent as Catalyst, Capacity Builder, and Concertmaster (Joshua P. Starr). Strategic Resource Allocation: The Superintendent’s Perspective (James P. Honan). Arlene Ackerman, School District of Philadelphia: The Quest for Educational Equity (Leslie Boozer and Laura Kelley). The Equity Fight in Utica, Michigan (Christine M. Johns). Why Family and Community Partnerships Are Important to District Reform (Karen L. Mapp). Beverly Hall, Atlanta Public Schools: From the Living Room to the Boardroom (Laura Kelley, Leslie Boozer, and Drew Echelson). Hit the Ground Listening (Carol Johnson and Michele Brooks). Scaling Up: The Key to School Improvement (Robert S. Peterkin). Rudy Crew, New York City Public Schools: Instilling Success in Every School (Laura Kelley and Leslie Boozer). Scaling Up Connections (Amalia Cudeiro). TEN Sustaining Improvement over Time. Replicating the ‘‘Long Beach Way’’ (Carl A. Cohn). Chris Steinhauser, Long Beach Unified School District: Eluding the Allure of Quick Fixes (Leslie Boozer and Laura Kelley). Building and Sustaining Improvement over Time: The Austin Story (Pascal D. Forgione Jr. ). ELEVEN Exiting the Superintendency (Laura Kelley). Epilogue: Demography Is Not Destiny! (Deborah Jewell-Sherman). About the Authors and Subjects of the Case Studies. What’s on the CD and How to Use It.